I’m totally in love with the look of iridescent party products. They are almost (almost!) to pretty to look at. If you love unicorns and rainbows you will love iridescence for New Year’s Eve! It has a fantastic light reflecting quality that screams party time, as well as picking up fun blue’s, pinks and purples, to create a fab futuristic, future-forward look. Try this simple DIY to take your disco ball dance floor into 2018 in style! If you love the look of these, be sure to check out the rest of my NYE Iridescent Party details here. You’ll find all of the supplies you need to bring your disco balls into the future on Oriental Trading in the Party Supplies and Craft sections. This is an extremely easy craft with high impact results! Adhere the Iridescent Jewels onto the disco balls with glue. Let dry. Hang and enjoy! Note: Vary the size of the jewel used and the placement. For example, put 3 large, 1 small in a grouping next to 5 small and 2 large. This step should be supervised if the children are younger and you are using a glue gun. 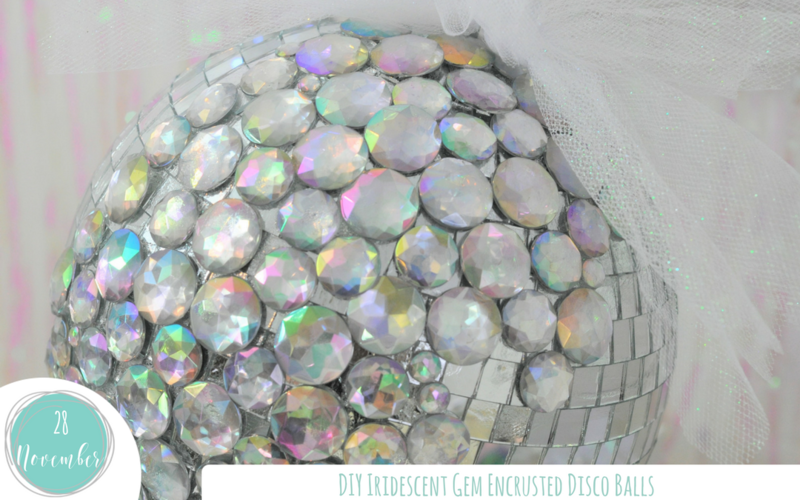 This craft works for different size disco balls and is fun for all ages. You can either hang the finished ball or place on a stand or directly onto the table. The jewels make it relatively easy to keep the ball stable if placed on a hard surface. Use a cutting of tulle and tie to the disco ball at the loop for a fun look. With love and wishes for happy crafting and parties!